Volkswagen introduced the VW Tiguan R-Line in Frankfurt in September. One version shown was a concept with a plug-in hybrid drivetrain wearing the GTE badge. Volkswagen will unveil an SUV concept at the Detroit auto show powered by a plug-in hybrid powertrain, highlighting the automaker's effort to beef up its presence in electric vehicles. The car will be a plug-in hybrid version of the next-generation Tiguan, the automaker's top-selling SUV, two sources told Reuters on Friday. 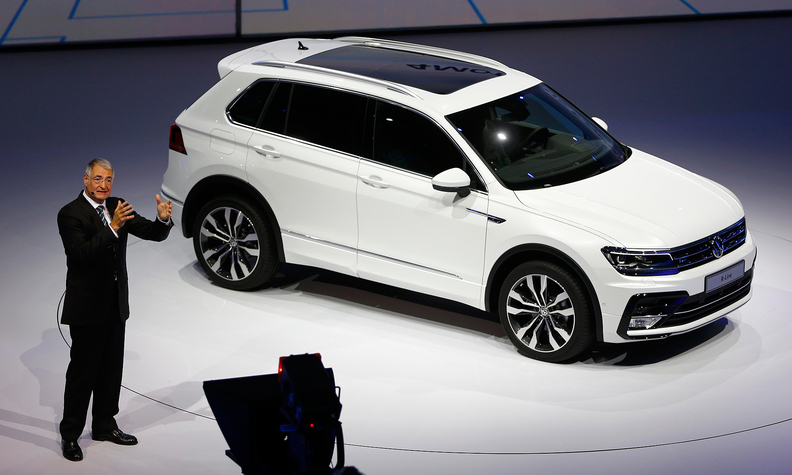 Volkswagen has already shown a plug-in hybrid version of the next-generation Tiguan, dubbed the GTE, at the Frankfurt auto show in September. The concept being shown in Detroit next week will be a more off-road capable derivative of that car, Automotive News has learned. The concept reflects both VW’s push towards electrification globally and its longstanding plans for an SUV blitz in the U.S. market, with three new or redesigned crossovers expected to arrive here in the next two to three years. Analysts say VW badly needs new models in the world's second-largest auto market to reverse a three-year decline in sales which fell 4.8 percent in 2015 to 349,440 cars. "VW can't release an SUV soon enough," Edmunds.com analyst Jeremy Acevedo said. "SUV market share is at its highest ever level (in the U.S.)," with compact SUVs such as the new Tiguan accounting for 13 percent of all U.S. auto sales in 2015. The German group is struggling to balance model development with the growing costs of its emissions scandal, a task made more difficult this week by a U.S. lawsuit seeking billions of dollars in fines. Still, demand for hybrid and electric cars has been dampened by cheap gasoline as well as limited range and high prices. U.S. sales of hybrid and alternative power vehicles plunged 11 percent in 2015 to 297,455 vehicles, according to the Automotive News data center. However, automakers are under pressure to sell more electric cars amid toughening regulations to curb greenhouse gas emissions. The VW Group has plans to launch 20 new plug-in hybrids or battery electric vehicles by 2020, a move that has taken on added reputational importance in the wake of its emissions scandal. "Perhaps VW was so successful building cars in a conventional way that the necessity to fully engage with several new aspects of mobility has not been recognized," CEO Matthias Mueller told Wirtschaftswoche magazine in an interview published on Jan. 6. "That is now different." VW also aims to launch a new modular platform dubbed MEB for electric cars, the first of which should arrive around 2019 or 2020. "We are developing entirely new and unique vehicle concepts especially for long-distance electric mobility," VW brand chief Herbert Diess said on Jan. 6 at the CES. "We are renewing our thinking, our approach and our products." Research firm IHS Automotive forecasts the VW brand's U.S. sales may plunge another 13 percent this year, before rebounding in 2017 with the help of SUV launches and steadily growing to 507,794 cars by 2020. Ryan Beene and Reuters contributed to this report.